If you are new to drawing, you may be wondering, “What’s with all the numbers and letters on my drawing pencils?” I am here to give you the truth about pencils, and while I am at it (and since it sounds so good) I’ll give you newbie drawers out there some eraser options to try out. Drawing pencils usually have a number and a letter on the end – this let’s you know the softness or hardness of the graphite in the pencil. The letter will either be a “B” or an “H”. The “B” stands for BLACK and the “H” stands for HARD. 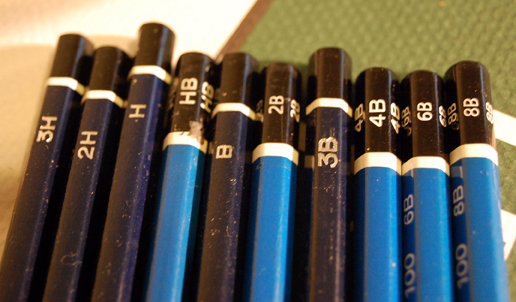 The number on a “B” pencils starts with HB then 2B, 4B, 6B, 7B, and 8B. HB is the equivalent of a #2 pencil – like the kind you needed to take tests in school, then the pencils get progressively softer as the numbers go up. 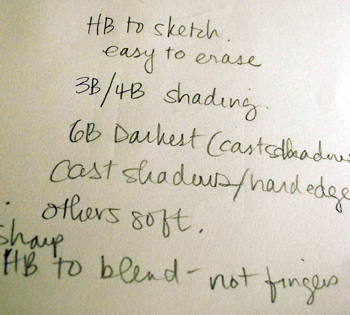 8B is the softest, therefore the blackest of the “B” pencils. The “H” pencils are opposite – the higher the number the harder the pencil. 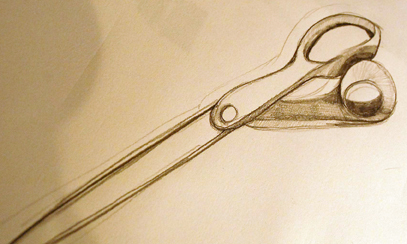 These pencils are usually for drafting since they make very thin, light lines. 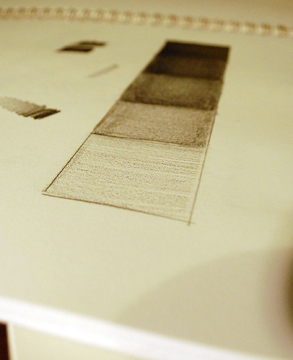 Start by testing out your pencils – see how they work when you press hard and when you ease up on the pressure. This will help you to learn what they are for! 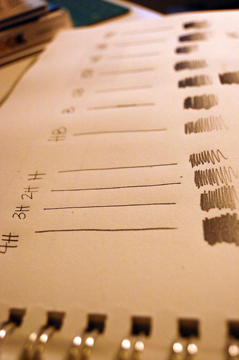 1. create 5 boxes, at least 1/2″(or more if you have the time) Choose a pencil for your scale. 5. continue to shade the boxes until you reach the lightest block – this happens to be the most difficult box to shade since it is the lightest and takes the lightest touch. Here’s the trick to well blended shading – it’s not a tortillion (a stump of paper used for blending pencil) or your finger – instead use a VERY sharp HB pencil to lightly move the pencil in your value scale around, this will create a smoother effect. There are a few choices when it comes to erasers. Some artists like the eraser that lives on the end of a mechanical pencil – this is nice to precise erasing, since it is small. This eraser is basically the same as something like the Staedler Mars white eraser. These are good quality, clean erasing and worth the money. 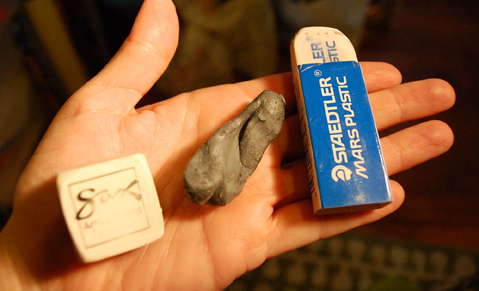 To remove dark pencil and charcoal try a kneaded eraser – these are squishy grey material that can be molded, made smaller and reworked to clean the pencil out – to a point – eventually then get “full” and cannot be reworked to clean – but in general they last quite a long time. Where can I get a pencil set? The erasers can also be found in the same locations. My last bit of advice is to take notes for yourself in your sketchbook, so you remember what pencils work best for which drawing. Here is an example of some notes I jotted down when putting together this article. If you have any questions, please feel free to post them in the comment section of this article! Just include your email address with your post to enter to win. The show will include unique contemporary crafts and artwork from more than 300 artists working in ceramics, sculpture, glass, jewelry, fashion, furniture and home décor, fine art and photography. There will also be gourmet food for visitors to sample and purchase, live entertainment, and artist demonstrations. Something for everyone! 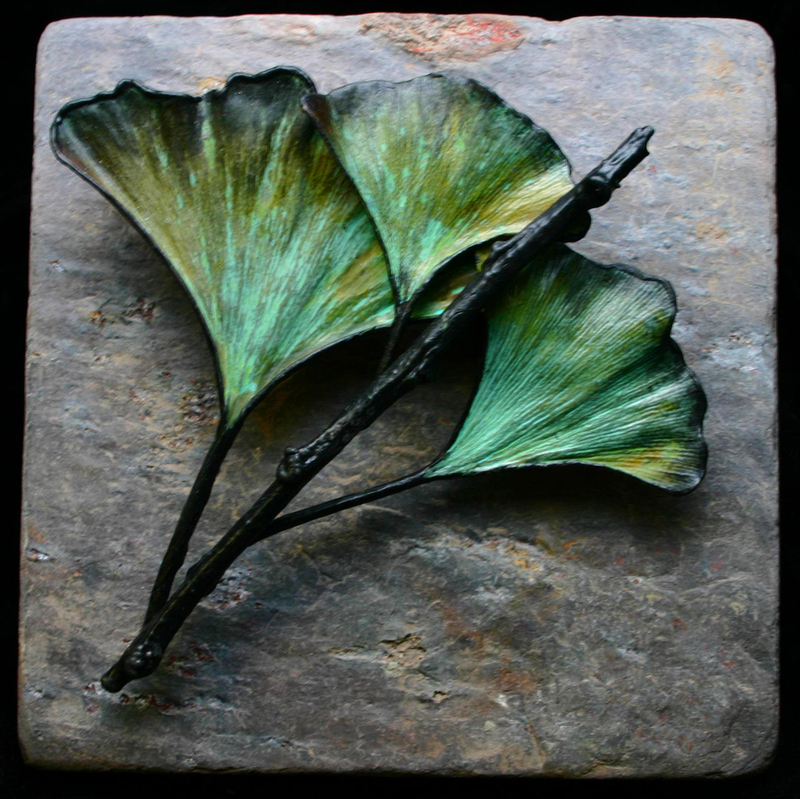 – MaryJo Rosania-Harvie is a high school art teacher & artist who simply loves art supplies! Nice! I actually love a mechanical HB – they are so versatile. Great article and tutorial. You included so many great tips, thank you! Editors Note: UPDATE! The tickets have been given away!